A classic take on an edgy coat. I&apos;ve been on an outerwear bender lately. It&apos;s a category my closet seriously lacks, which came to my attention over the last few weeks of rain and cold weather (at least for Southern California). I couldn&apos;t have timed it more perfectly though, because there are so many end-of-winter sales happening now. Many of the coats I&apos;ve come across look expensive, but are under $100. This textured trench is a perfect example—it has a very on-trend shearling panel detail that makes it look luxe (if you prefer something shorter, our Sonya Moto Jacket, also on sale, has a similar vibe to it). 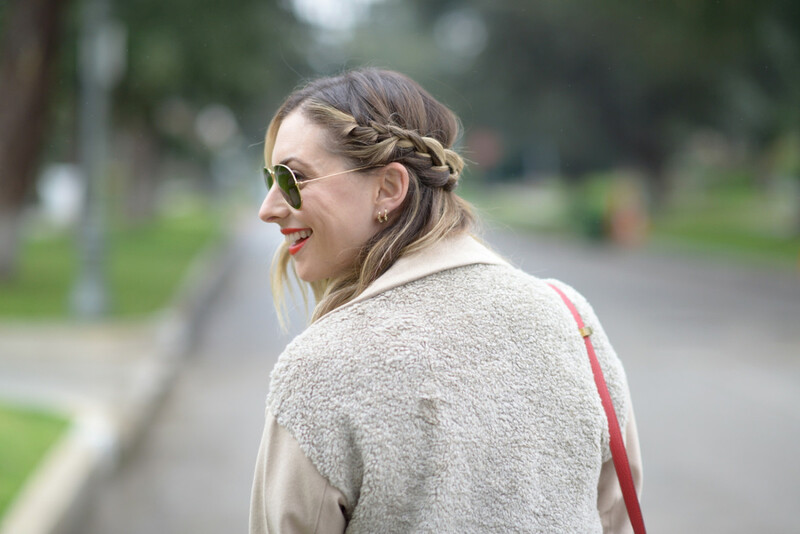 To style it, I threw up an easy side-braid that mimics the asymmetrical texture of the trench and wore some of my favorite, Rococo-feeling Chanel heels that Geoffrey bought me years ago on a trip to New York.